The STPs published to-date set out a dynamic, transformational programme for improving both quality and efficiency across health and social care. 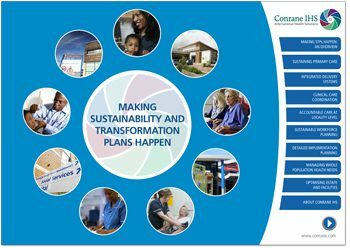 Having reviewed these documents, we have developed a set of guidance notes designed to help senior clinicians and managers working on STPs to move to the next phase which is to convert these exciting aims objectives and proposals into best practice, locally bespoke solutions for implementation. We are focusing on those areas where we have specialist expertise and experience, and where we have demonstrated ‘triple-aims’ outcomes over relatively short timescales. These include major STP enablers and innovations where in partnership with clients and our international collaborators we can accelerate the agenda.